I don’t often write “How To” posts, but I’ve been repeatedly asked how I do my quiet time and how I make time to write. This always makes me smile, because I love a good, well laid out plan for some things. I also really enjoy the chaos of flying by the seat of my pants. And I’m a little bit of a drama queen. My quiet time just happens to be an interesting, quirky mix of those characteristics. As a warning, before I share my morning game plan, I want to point out a few obvious things. First, I’m not any type of professional at Bible study and prayer. Secondly, what works for me, may not work for you. And Third, I know that this is going to sound a little odd, so just humor me and go with it. Ok. Here it is. My game plan. As I mentioned, I’m an odd combination of OCD, chaos, and drama. The OCD in me really enjoys an organized, regular, predictable plan. I love lists and journals and organized approaches in some specific things. I like to start my quiet time in a very predictable, well planned out way the evening before. Before I go to bed at night, I lay out all of my materials. 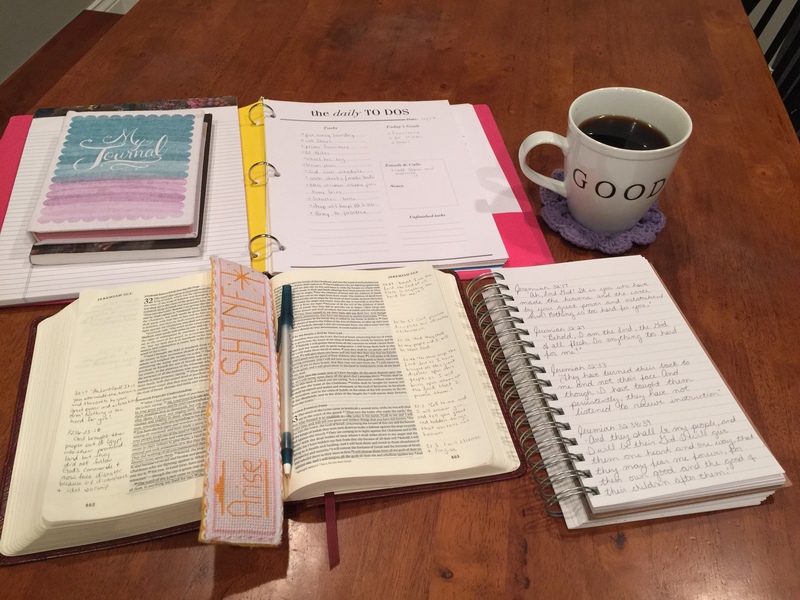 When I have my time in the morning to study and pray, I like to have my journaling Bible, my binder, my journals, my pen, and my coffee. I have one of those amazing coffee pots where you can make your coffee the evening before and set it to start brewing at a specific time. I set mine for 5:10. That’s 5 minutes before my alarm goes off. That means that when I wake up in the morning, I can already smell that delicious Three Story Coffee percolating in the kitchen. It’s pretty glorious! Those are my necessities. They each have a purpose that facilitates my time and how I use it. When they are all lined up like that on my kitchen table, they are very hard to ignore in the morning. I set three alarms five minutes apart. 5:05, 5:10, and 5:15. (I really like my sleep, ok?!?) when my last alarm goes off, I tell Jesus good morning and that I’m on my way. I am aware that all sounds a bit silly, but here is why it works for me. I am a super relational person. Friendships and relationships are supremely important to me. I would NEVER make a date with a friend and not show up. I want to be a good friend, and Jesus just happens to be my best friend. I dare not miss our morning coffee dates! As I said, the OCD in me loves to wake up to a perfectly laid out table and a steaming coffee pot, but the chaos in me like to have a loose approach to the way that I actually do my study time. There are a few standards that I like to follow, but my actual routine is flexible. I always begin my time praying. It’s not a big, deep, scholarly prayer. Most often, my prayer is often just a little “thank you for meeting me here again this morning Jesus. I’m ready to listen to you speak”. After that, I dive in to my Bible reading. Currently I’m reading the Bible through from front to back, so I just pick up where I left off the day before. I like to use a journaling Bible so I have space to underline, jot notes, ideas, and verses. Beside my Bible is my journal. I keep it open and as I’m reading through my Bible, I like to write out specific verses that jump out at me. Reading them and then writing them out really helps me to to solidify them in my mind and store them in my heart. I learn best by doing, so I write a lot as I study. I don’t like to have a specific reading schedule. I read until I feel like God has spoken something to me. When He has, I stop. I make notes in the margin of my Bible. I think on it a bit. I write out the specific verse that struck me in my journal. That’s it. It’s not rocket science, but it has been what works for me. Sometimes I will read chapters and chapters before something specific really grabs at my heart and sometimes it’s much shorter. I try to just be sensitive to the Holy Spirit’s leading. When He prompts me to think about something, I take the time to really consider it and then I process through it by writing out notes. That consideration usually culminates in my prayer time. Along with the OCD tendencies, I’ve got some serious ADD tendencies as well. I get distracted easily and prayer can be difficult for me. My mind wants to wander. My solution is to write out my prayers. It keeps my mind more focused. I simply flip to the next page in my journal and write out whatever is in my heart. It’s like my coffee time conversation with Jesus. I write it as a letter to Him. I have found that it is the easiest way for me to have focused prayer time. I also keep a journal of prayers specifically regarding my hubby and my boys. When there is something that I feel like requires specific prayer on their behalf, I pull that journal out and pray for those needs there. I’m a fan of lists and I love my handy dandy binder. It’s like my little organizational hub. I keep our weekly and monthly calendar in my binder along with our dinner menu, our weekly chore charts, info on work and homeschool projects, and my ever important to do list. After my quiet time, I like to take all of this before God. I thumb through my plans and look them over to get my bearings for the day. Then I flip to a my blank To Do List for today. I say a quick prayer asking God to give me a vision for what I need to do and then I jot down my priorities for the day. This is may all sound a bit out there, but it’s how I like to start each morning. I intentionally get up a couple of hours before my kiddos and even before my husband. I spend some focused time alone with Jesus and then I plan out my day. It is what works for me and it seems to bring the level of crazy in my day down to a more manageable level. I also have a hard and fast rule that I force myself to stick to. I don’t allow interruptions during this time unless it’s an emergency. (That’s easier to enforce because everyone in my house is often asleep.). I don’t look at my phone until after this time is over. I don’t check Facebook or Twitter or my email or anything else until I’ve had my quiet time in the morning. After I finish my quiet time and my to do list, then, if I feel inspired, I write. That’s when I may log in to WordPress and blog. I might log into Facebook and post on one of the ministry sites I help manage. I may log into word swag and create some memes for social media ministry. My creative juices are usually flowing after some sweet time with Jesus and my mind is calm enough to write after I’ve tackled my daily plan. I’d love to encourage you to make your own game plan for each day. I’d also love to hear about how you spend time with Jesus and how you start your day.